After having fallen into the hole of wearing all black (mourning the spring we haven't had of course) I've been wanting to ditch my dark wardrobe for lighter colours - reserved exclusively for the days when we get sunshine rather than rain which sadly, have been few and sparse but I'd like to think there's still hope. Sometimes adding colour can be daunting so when ditching black why not do a full 360 and go for white instead?! White has been very popular on the high street recently, I've seen so many white pieces and a vast array of all-white looks on Instagram so naturally, I'm sold and have been slowly but surely integrating more of it into my spring style. Honestly, I would usually shy away from an all white look but recently I've just been going for it! It can be hard to find the right shade of white, this probably sounds crazy but you'll notice some white pieces are actually off-white rather than a pure, clean white and this is particularly noticeable when you're playing mix and match with various white pieces. Making it surprisingly hard to put together an all-white outfit. With that said, once you've found a couple of white pieces that are the same shade or similar you're pretty much good to go. I started off by incorporating a white jumper into my daily style, the one I'm wearing here is from H&M and has been a pretty good fit. I love the unusual cut around the neck (although I get makeup stains on this far too easily!) and the fact it's a white jumper makes it far more spring-like, if I were wearing this in any other colour it simply wouldn't feel as spring if you know what I mean. I began ditching dark jumpers and opting for lighter shades instead, even under my big blanket coat it instantly transforms my outfits into a spring ensemble. Another easy way to add white is through your accessories. I'm sure you've probably seen this basket bag already, it's been on my Instagram a couple of times, and on some other bloggers too - it's quickly becoming a firm favourite within the blogosphere! It's from Dune and comes in at £70 which is a little more on the pricey side but when compared to other straw/basket bags, it's worth it! It's sturdy, keeps its basket shape, it's lined on the inside meaning you can wear this even in the rain *woohoo* and it's a really good size too. 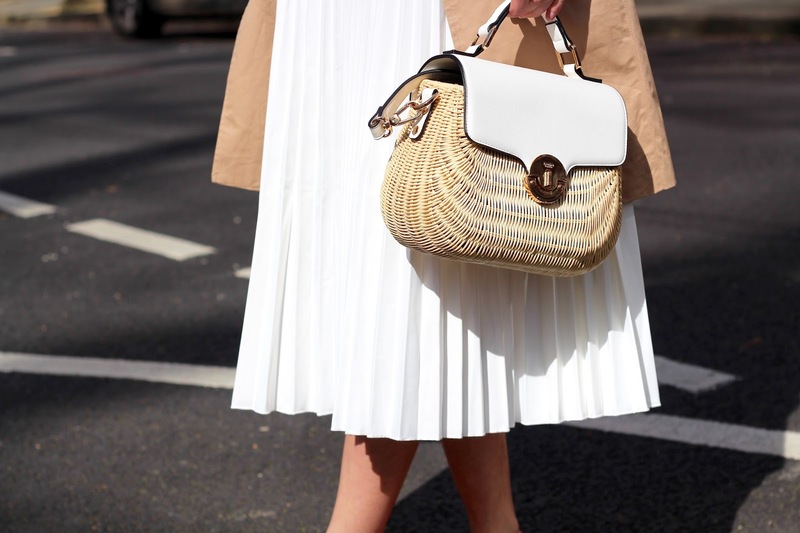 I love that this isn't completely white so it's fairly easy to incorporate into your outfits whether you're wearing white or not and not only are you adding white to your wardrobe, you're also incorporating one of this season's hottest bag trends: straw bags. Win, win! If you're trying an all white look, similar to what I'm wearing in these photos, go for some neutrals to balance things out. A spring staple, a trench coat or mac (I still don't know whether there is even a difference between those terms) is the perfect way to add a neutral colour to your outfit. I'm wearing an oversized trench from Boohoo which has all the traditional features of a trench coat, the large lapels and buckles, but is an oversized fit (I'm wearing a size 8 for reference) so I've tied it up at the back which gives the illusion of a more fitted look from the front, and serious Inspector Gadget vibes from the back. I'm actually really excited about wearing my tench coats again, I haven't been able to on a daily basis because the weather is just so up and down right now. However, I've been religiously checking the weather forecast and it looks like it could hit the 20's in the UK by early next week! So here's hoping we finally get some sunshine and I'll finally be able to make the most use out of my spring wardrobe. I have everything crossed for it! I'm struggling with spring footwear at the moment, not knowing what to wear other than my trusty ankle boots which I genuinely wear all year round! So in a bid to swap ankle boots for some spring alternatives, I've been experimenting with more styles whilst trying to work out what the best fit for me and my style is. These casual lace up espadrille trainers are from Emu Australia and offer this look a pop of colour but tie in nicely to this look with the espadrille/natural looking sole. If you're into wearing colours, whether those are brights or pastels, you can easily pair existing pieces with white because quite frankly, anything goes. Your style is your own, that's why it's personal style after all so you can incorporate trends, colours and/or styles in any way that works best for you. I wanted to share a few ways I've added white to my spring outfits as I think it can be tricky to take that first step and a few tips never hurt! Hopefully you found these helpful. Thanks for shifting to a Spring outfit look - it's nice to see. I too love Spring and am hoping it arrives now that the Nor'Easter I just experienced has ended. At least it's not freezing. I love the look of your outfit. The pleated white midi-skirt, white jumper and pink trainers look great with the beige trenchcoat. The trenchcoat and an umbrella are stylish in those often unpredictable Spring showers. It's pouring rain where I am right now.